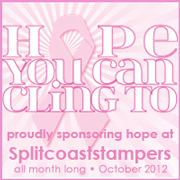 Did you know that Really Reasonable Ribbon is a sponsor for the Splitcoaststampers Hope You Can Cling To card drive? It's a month-long card drive for Breast Cancer Awareness and there are prizes valued at over $6500 up for grabs! This design today was made for one of the challenges. You have until November 7 to join in and be eligible for some of those crafty prizes! For this challenge we were to use the letters "HYCCT" and have something on our card that represented or started with each letter (keep reading!). I chose Chicken Girl Design's Birthday Wishes for my images. I stamped on X-Press Copic Blending Cardstock with Memento Black ink, and then colored with Copic markers. 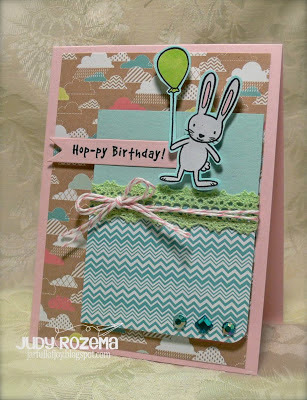 My designer paper is from the Everyday Eclectic Collection by Echo Park. The sweet Light Celery Green crocheted lace and Cotton Candy Pink baker's twine finish off the card, along with some aqua gems in my stash. My layers are popped up using Zva Adhesive Dimensional Squares. Come take part in a wonderful cause -- you might win one of the awesome prizes sponsored by Bonnie at RRR! This is so cute Judy!!! !